When one becomes a patient at the Dana-Farber Cancer Institute (heaven forbid that should happen to you! ), one is issued a patient identification card. You then show that card every time you check in for an appointment. As you know if you read along here, one has many appointments. So that card was always on top of all the other cards in my wallet. 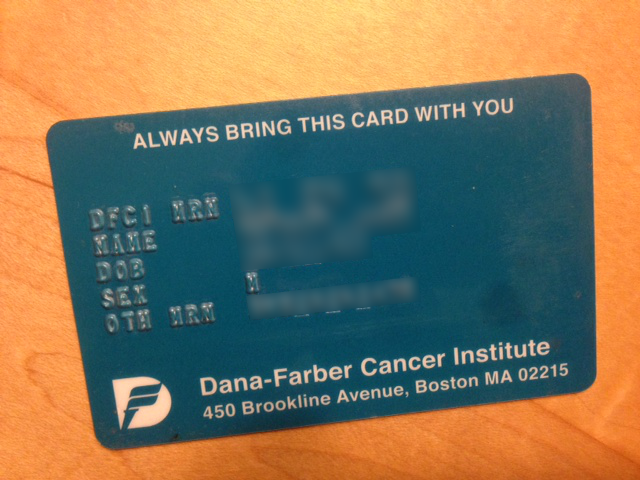 Today I needed to call Dana-Farber to reschedule my next surveillance appointment. As I dug out my card, I noticed that it has become buried fairly deeply in the stack. Treatment is receding into the past. I've mentioned before that I don't really have vivid memories of the treatment experience. I remember mostly the "good" parts - namely all of the great care I received from family, friends and health care providers. That's kind of how my memory works in life. However, for months I've intended to write about how prominent cancer still is in my mind. I think about it many times every day. I'm reminded of cancer every time I eat, for example, since taste and saliva are still profoundly affected. The lack of saliva also leads to thicker mucous in my throat so I'm constantly clearing my throat and fairly frequently coughing up a little wad of thick gunk. I'm still inclined to blurt out that I recently had cancer to people I don't know well. I find myself thinking about ways to work it into conversations (although thankfully I usually refrain). It feels like a surprisingly significant part of my identity. I expect that will fade with time. Here's one more piece of identity. I was talking to a friend about the saliva issues and he told me he had a very positive experience in the past with Pilocarpine, a drug that can help stimulate saliva. At my last Dana-Farber appointment I asked Dr. Chemo for a prescription, which she was glad to write and send to my pharmacy. But then I didn't pick it up for several days. And I still haven't gotten in the habit of taking it. Part of the reason is probably that I have to take it three times a day and it's difficult to start a new habit like that. But more than that, it feels like it threatens the status quo. The side effects are part of that new identity and perhaps I'm more emotionally wedded to it than I would expect. I've also had moments of concern that it might produce too much saliva - a problem that is very unlikely! On the topic of memory, I had contact today with the wife of Big Sister's oncologist colleague who kindly gave me remote consultation right after I was diagnosed. I was expressing my gratitude to her to pass along to her husband. I choked up at my desk at work typing those words. For a moment I could clearly remember the fear we felt during that period and the gratitude we felt for information that gave us just a little peace of mind. I feel like I'm doing a pretty good job of getting on with life but I'm surprised how much cancer baggage I'm still dragging along. I guess it was somewhat of a profound experience.